Heat oven to 350°F. Spray cookie sheets with cooking spray. In medium bowl, beat cookie mix, butter, coconut and egg with electric mixer on medium speed until soft dough forms. Shape dough into 48 (1-inch) balls. On cookie sheets, place balls 2 inches apart; flatten slightly. Bake 12 minutes or until bottoms are golden. Cool 5 minutes. Remove from cookie sheets to cooling racks; cool completely. In small microwavable bowl, microwave chocolate and whipping cream uncovered on High 30 seconds; stir. Microwave 30 seconds longer, stirring every 15 seconds, until chocolate can be stirred smooth. For each sandwich cookie, spread about 1 teaspoon chocolate mixture on bottom of 1 cookie. Top with second cookie, bottom side down; gently press together. Let stand until chocolate is set. 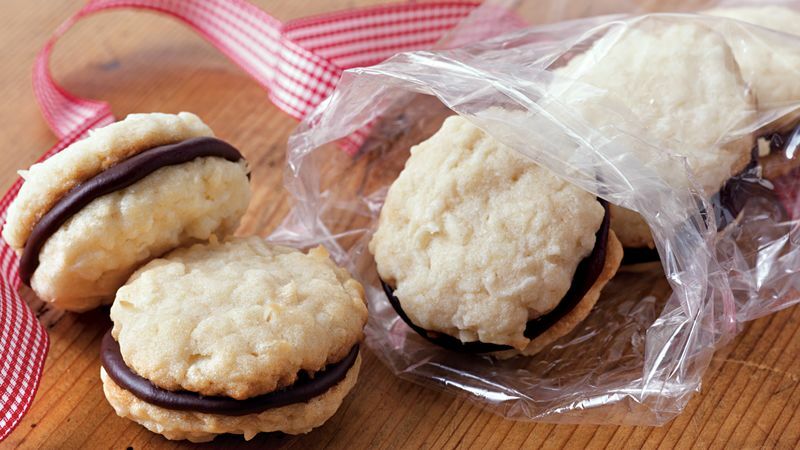 Give small bags of these sandwich cookies tied with holiday ribbon as gifts to loved ones.